As a personal challenge, after seeing a few genealogist friends on Facebook post ancestor charts with photographs of their ancestors back to (in many cases) their great-great-grandparents, I decided to see how “complete” my collection of ancestral photos was. I have quite a few photos myself and have scanned many that other relatives have had over the years. This has often been a result of contacting second or third cousins, usually with around a 5-10% success rate when a relative actually turns out to have photographs of our common ancestors. 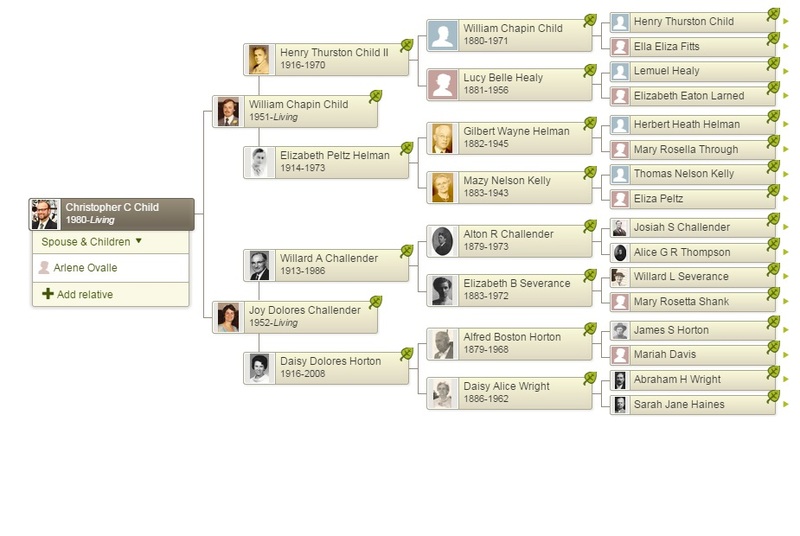 Having gone through my own personal collection, I now had 6/8 great-grandparents and 7/16 great-great-grandparents. I wanted to complete my mother’s side first, since I was only one photograph away. This was Mariah (Davis) Horton of Jackson County, Ohio. Years ago I visited the family farm for this side of the family, still maintained by my grandmother’s younger first cousin. I contacted his son, my mother’s second cousin, who readily supplied me with a picture of Mariah and many more! (My request prompted him to organize and scan dozens of family photos.) My mother’s side complete, I then turned my attention to my father’s side. Child family photograph, early 1920s. 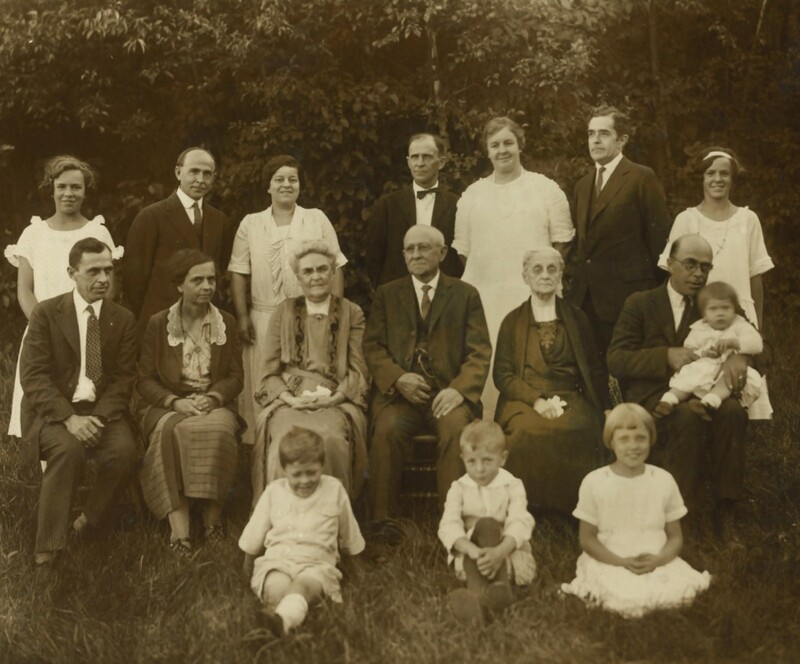 Pictured, middle of front row sitting on ground, my grandfather Henry Thurston Child II; in back row, fourth and fifth from left, are Henry’s parents William and Lucy (Healy) Child. In middle row, third, fourth, and fifth from left, are Henry’s three living grandparents, Ella (Fitts) Child, Henry Thurston Child I, and Elizabeth (Larned) Healy. My father’s father was from Woodstock, Connecticut. The NEHGS collection holds the papers of Clarence Winthrop Bowen, a wonderful genealogist of all things Woodstock. In this collection are many photographs, and here I found a photo of my grandfather’s grandfather. Still, this left five more ancestors for this quarter. I contacted many relatives, including my father’s first cousin, who owns the family farm my grandfather grew up on. His wife sent me a package with many family photos, all identified, with pictures of my grandfather’s parents, paternal grandparents, and maternal grandmother. For this quarter this just left Lemuel Healy, who had died just a few years before this family photograph was taken. I have managed to get all of my great-grandparents (and I am older than you lol) and I am missing 7 of my 2nd great grandparents although I have gravestone pics for a couple. I periodically do a google search for some on the off chance something might turn up. I did find one for my great grandmother that way….she was in a group of Women selling magazine subscriptions! I also use old post cards to illustrate where people lived. They are generally out of copyright and can be posted freely. Photos add context and literally bring ancestors to life. When I was working on a book on one of my ancestor branches, thanks to the internet, I very serendipitously found a cousin whom I had never met. She had inherited a large box of photographs that had been passed down to her from her GGG Grandmother, Amanda (Pierce) Johnson. Amanda was the sister of my Great Grandfather. The box contained many early family photographs that I had never seen. Amanda had moved to California in 1877, and had apparently received photographs from her siblings, many of whom who were then living in Kansas. Between my new found cousin and I, we were able to determine who were pictured in most of the photographs. Fortunately Amanda saved these precious photographs, because the Kansas family home was destroyed by fire in 1895. This example also underlines the importance of researching all the descendants of siblings in one’s family tree. That is how I found this cousin. The same happened to me. A distant cousin has her grandmother’s or great-grandmother’s box of pictures, and, miracle of miracles, the name of the people in every picture was written on the back of the picture. As far as “oldest” family photos are concerned, I have a particular line that is all youngest children, from me (age 68) back to my GG Grandfather (1765-1855) who actually was a RevWar veteran. I have his tin type. On the other hand, with my matrilineal line, I have 6 generations of photos of my mother back to my GGGG grandmother (1788-1869). This lady is actually 23 years younger than the RevWar veteran who is 2 generations later than her! I have photos of all 8 of my great grandparents, and 6 of the 16 GG grandparents. Also 1 each for my GGG and GGGG grandmothers. I have dozens of “family” images of all types that are not identified, making them totally anonimous! My greatest concern is what happens to these images, which are treasures to me, after I die. Bruce, a distant cousin of ours managed to save a box of family photos from a house where several generations lived; the last family resident had no children, so they were slotted for the trash! Anyway, there was a good-sized packet with no names. We id’d a few. For the remainder, I did this, just to put them online for extra safety: on my ancestry tree, I created a new person, not linked to anyone, and named them “Unidentified Couhig Photos”, birth “19th Century Masschusetts”. I added any information on the photo itself. They do, at least, show up on the media/photo pages and Search Results, so researchers can see they’re there. (Obviously, tho, it’s an uncommon name, which helps). Perhaps one day we’ll be able to identify them…until then, they’re online and safe. Over the years, I collected photos by visiting relatives and not leaving until they opened their drawers and boxes and let me borrow them to copy/scan. I always took with me extra photos of other relatives to barter with and carefully returned whatever I borrowed. Thus, I have photos of all grandparents, all great grandparents, half the great great grandparents and one great great great grandfather who was born in 1772 but lived long enough to be photographed. Some photos are taken out of composite family photos as head shots but only one of these is somewhat unsatisfactory. A photo really brings an ancestor to life so I collected photos of grandparents’ siblings and others. Believing that we all have a piece of the puzzle and it won’t go together unless we share, I have been generously making my collection available in order to promote this! Everyone should really appreciate photos they have of their ancestors. My father’s family photos all disappeared due to a family altercation. The only photo I have of my father as a child was from a group photo of his basketball team. In those days, small towns didn’t have high school yearbooks. I did locate some college photos by searching at the Cornell University Library. One of my cherished possessions is a confirmation photo of my Prussian grandmother taken when she was about fourteen. The family was very poor and had emigrated to Milwaukee, WI. Evidently, a confirmation photo was very important to a German Lutheran family. I shared my genealogy information with third cousins and they sent me a copy of this photo. Chris, I think your collection looks great! It’s sure not an easy task. Truly, the act of what one is trying to do here in giving “a face to just a name and dates” has to be one of the most rewarding and noble aspects of the research (and preservation) that we do. I know she won’t appreciate it much in between the balloons and the ice cream, but perhaps someday, the ‘who of who she is and where she came from’ will mean something to her in the faces in the photographs of family – on both sides of her tree. You’d think it might be easier because she was just born last year? Not so much! I still have way more photographs to discover than I’d prefer, but I am hopeful that I will be successful in preserving for her those immediate several generations that I may be missing parts of for myself. If I don’t get this done in time for her first birthday – well, I will keep at it for the 2nd! Great post Chris – what fun! My Grandfather on my mother’s side disappeared from the family when my Mom was about 4 so none of us knew him. The only picture I have is a small picture from a locket my mother had with his picture in it. I took it to a professional and he enlarged it and we noticed the family similarities right away. I love hearing stories about people finding old photos and the elusive family Bibles also. I have pictures of 7 of my g grandparents, which I’ve always considered doing quite well, as half of my family is Norwegian, and it was more recent generations who emigrated. I actually knew one Scots-Irish great grandfather, and have very vivid memories of him. There are some of my father took, and some when he was a young man. To the best of my knowledge, I only have two gg grandparents’ pictures. Unfortunately, many old family pictures are unlabeled, and I remember one dreadful day 30 years ago with my mother and sister when they threw out every one that was missing the names. At that point, my mother had living cousins who might well have known who the people were. They wouldn’t let me rescue the boxes of pictures, though. Now, all those people who might have known are dead. I do have gravestone pictures for the rest of the g grandparents, at least the ones in America. One of my first cousins just returned from a trip to the town in Norway where some of this family lived and has pictures. I know he went to the church where generations of family were married, baptized, and buried, so I’m hoping he took gravestone pictures. And my father took some of the gravestone pictures back several generations of his grandparents on a one-day trip through central IL in the 1970s. Forgot to mention those in my earlier post. They don’t give quite the “feel” of a person that a personal photo does, though, but they are a lot better than nothing. Well, Chris, from the replies to your very important blog, it seems that every story should have a picture, and every picture should have a story. The “gravitas” and emotion that a picture adds is immeasurable the closer to the picture one is. It would seem that with the giant steps that have been made in identification from facial features of heretofore unidentified photos,. that perhaps someone such as NEHGS should consider setting up a photo treasury where such work could be done on “old disposable photos”. Having just acquired 5 boxes of same, with about half having identities, and knowing that an “uncle” in my Grandmother’s line was shown to be a “Daguerreist” ca. 1865, then of course I believe most of these photos were taken by him; perhaps not all family, but mostly others of community, church group, etc.. Destruction of photos should be a capitol crime. Keep up the good work!!! Three cheers for photos and DNA!!! William, there used to be a website that was dedicated to unidentified photos…I saw it about 20 years ago and cant for the life of me recall what it was called. Perhaps it’s still up and someone on here could tell us the website? And I must remind myself and anyone one else listening, DON’T THROW IT OUT !! What we see as brick walls and impossibilities are going to be everyday, run of the mill, PIECES OF CAKE for our next generations. Thank you. I have almost no family photos. Many older photos- boxed and framed- disappeared shortly after the death of my father while the house was full of people. My brother has a few, but most of the ones I had of our immediate family were lost in a move. There is something about that kind of evidence that connects one with the individuality of one’s ancestors. I had the same thrill when I located the birth record of my 3th great grandmother, who was born in a town only a short drive from where I live. I found myself in tears. I forbid a brienf to throw out his family photos- the ones he was unsure of-not being a semtimentalist, he said. I now own photos of people I don’t know, at all. I am wondering how to approach making those public so that family might find their photos and claim them. Any ideas? While driving through Woodstock today, my father was reminded of the old Child family farm that he remembered visiting when he was a small child in the 1930s – he wondered if it still existed. So I thought I’d see what I could find. It didn’t take long before my search landed me on this blog post! 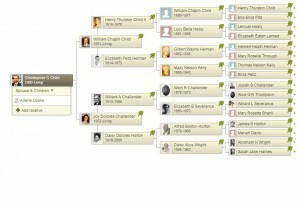 Chris, I believe my father, Charlie Chapin, was fourth cousins with your grandfather, Henry Thurston Child II. I have a picture of my great-grandfather, William Porter Chapin and my grandfather, Robert Crins Chapin, with William Chapin Child and his father Henry Thurston Child on the occasion of HTC’s 79th birthday, June 26, 1925. My ancestors lived in Providence at the time. Our common ancestors are Eli Kendall and Tryphena Eaton. I descend from their daughter Almira. Almira married Jedidiah Morse, the grandson of Jedidiah and Sarah Child Morse. So we have those common ancestors, too. I guess once you have a Woodstock connection, the likelihood of having more than one is pretty high! Anyway, it was interesting to read that the farm is still in your family so many generations later. I sent the picture that you posted to my father to see if he would recognize anyone. Nancy – I just saw your response now. I am very interested in any photographs you have! You great-grandfather William Porter Chapin was a second cousin to my great-great-grandfather Henry Thurston Child, and they were apparently best friends, and he named his fourth son (my great-grandfather) after him. My father, in turn, was named for him. My father has a shoemaker’s bench that was given by William Porter Chapin to his namesake cousin. I have traced William Chapin’s ancestry aways back, besides being second cousins, William and Henry were third, fourth, and fifth cousins as well through other Woodstock and Ashford ancestors. I’d be very happy to send what I have on our common ancestors. My e-mail is cchild AT nehgs.org or you can call me at 617.226.1282. A picture is worth a thousand words! I was adopted so never looked like any of the family in which I grew up. I knew my bio father but had never met any of his family. In my 70s, I started my bio tree and found a picture of my father’s mother. I look EXACTLY like her. I now feel complete that I look like someone………It was very comforting.